I will be joining with thousands of people nationwide this fall to walk in AFSP's San Diego WalkOut of the Darkness Community Walk to benefit the American Foundation for Suicide Prevention. With my work at a high school counselor, I have worked with students who have a hard time dealing with the pressures and stresses of their daily lives. Unfortunately, some have contemplated suicide. Yet, with the help of caring friends and family, they have been able to heal. Lumpia, what is it? If you are Filipino, or have Filipino friends, when you hear the word "lumpia" you start to salivate. Lumpia, is the Filipino version of the Chinese egg roll. Crispy and all yummy goodness! 10 years ago when I first heard about "Lumpia: The Movie" I thought it would be a culinary move perhaps, a "how to" movie, or even a documentary of the history of lumpia. I would have never thought "Lumpia the Movie" would be about a misfit pack of friends who do their best to stand up to a crew of thugs by delivering justice one deep-fried lumpia at a time! Looking for Ideas for a Date Night? For my last birthday, I had dragged my husband to take a painting class with me. Neither of us are "artists" to say the least. He always goes along with the random things I want to do to check off my "bucket list". Our "sunflower" painting masterpieces were a result of our first painting class together. My husband even got compliments from our teacher! At the end of it all, he said "This was fun! We should do this again!" So, when I was chosen by La Jolla Mom and the Details Matter App to be a part of the 30 Dates in 30 Days project with a painting class with Wine and Canvas, my husband was all in! Details Matter is the first app dedicated solely to sharing date ideas. 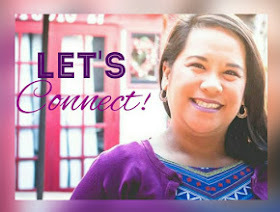 Find different, creative, and unique date ideas by following what other local daters are posting. Return the favor by posting and sharing dates that you have discovered! It's Time for Adventure with the Octonauts! Mommies and Daddies! Do your kids love Octonauts from Disney Junior? Check out the Octonauts at their San Diego Launch Pad at Westfield UTC on August 30th from 10am and 12pm under the central clock tower in Palm Plaza. 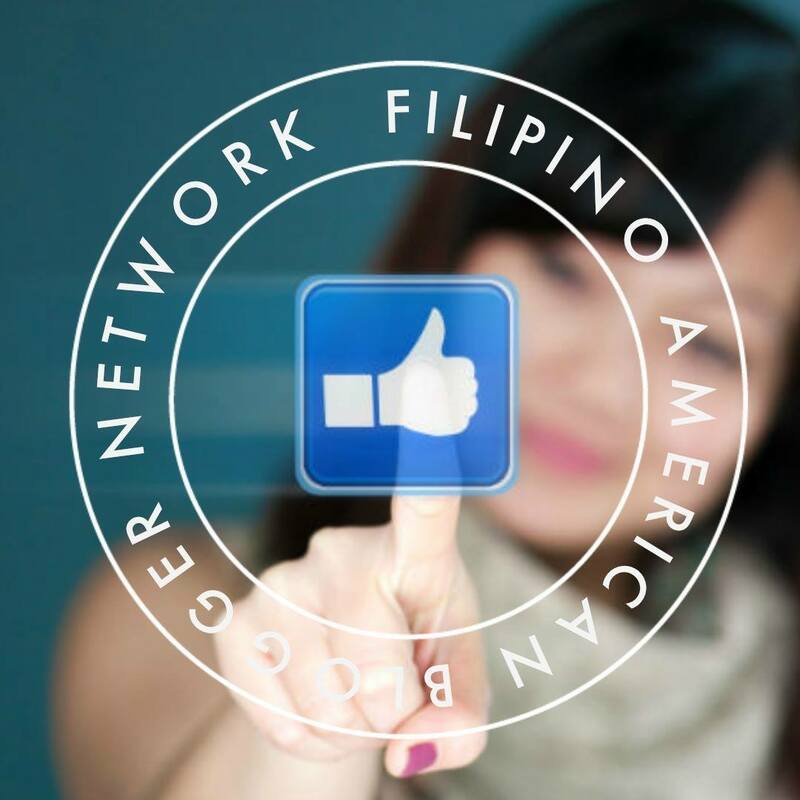 For more about the event, check out the official Facebook invite page. For more about the Octonauts and their adventures, check out their official website. Hope to see you at the Octonauts underwater adventure at Westfield UTC on August 30th! Help Your Kids Avoid Summer Vacation Brain Drain! “Summer is a great time to help children grow and prepare for the grade ahead,” says George Starks, “and parents are a child’s greatest teacher.” Starks is the creator of the Summer Fit Activity Book series, a colorful, fun-filled and action-packed, grade-specific series of workbooks, written by teachers specifically for independent use by educators, parents, and trainers throughout the summer. Read more about Summer Fit Activity Book series on my recent post on www.SDMomsBlog.com! On a visit to True Foods Kitchen, I had my first quinoa pancakes and it was super yum! I couldn't wait to make my own at home. I've experimented with quinoa pancakes, making sweet ones with chocolate chips for my boys. My boys are picky eaters so making pancakes with quinoa was a bit of a risk. I was surprised that they didn't even notice! I used white quinoa so it was hidden well! 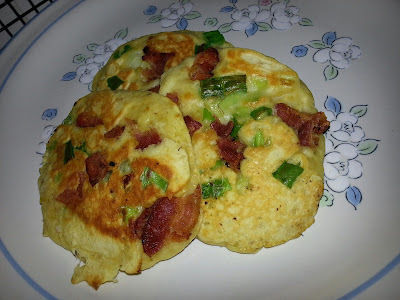 This morning I tried to make my first batch of savory quinoa pancakes. I used a recipe from The Patrician Palatte which I modified a bit. Some people surf, read, or play video games - all to relax and turn one's brain off from the hustle and bustle of daily routines. For me, one of my loved diversions is baking! Since the school year started (I work at a year-round school), I've been too busy to bake. I took some time out this evening to bake some goodies for my school counselor coworkers who have been working hard to get the school year started off smoothly. 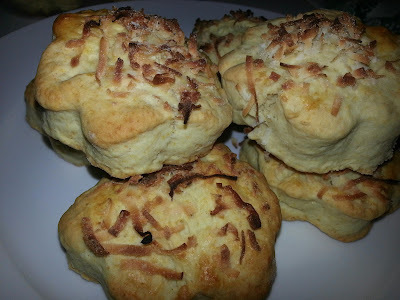 Thanks to This Simple Gift's scone recipe, I modified it a bit to include some coconut flavors! The recipe below is super easy! Enjoy! Wine tasting is one of our favorite activities with our group of friends! We're lucky to have dozens of wineries about 30 minutes drive from our home. For our one friends birthday, we scored an awesome deal on a wine tour and tasting package from travelzoo.com. 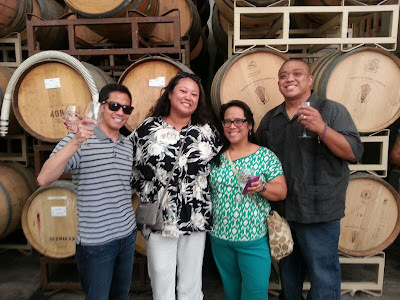 Our wine tasting and tour was at Keyways Winery in Temecula, California. Our wine tour included a walk through the vineyard with an explanation of how the vineyards are maintained. We even got to pick some of the grapes right off the vine. Our visit to the winery was perfect timing because the grapes were about to be harvested in a few weeks. The vines for full of bunches of grapes. It was beautiful to see.